Still a child, Muhammad Hasan Shirazi lost his father, and was placed at the custody of his knowledgeable uncle, Sayyid Husayn Majd Al-Ashraf. At the age of four, the young Muhammad Hasan enrolled at Maktab, a local school and at the age of six, he joined the Islamic Seminaries. Since his early years at the Seminary, the sharp mind and strong memory of Sayyid Muhammad Hasan brought about praises by everyone. or of Shiraz, when he was offered a decent position at the court of the city; but Muhammad Hasan refused the offer and continued his passion for the knowledge of the genuine Islam and the pure Household of the holy Prophet of Islam. Therefore, Sayyid Muhammad Hasan Shirazi enrolled at the Islamic Seminary of Isfahan, which was the most famous Islamic seminary of Iran in that period. Sheikh Muhammad Taqi Isfahani, the author of “Hidayatul Mustarshidin” was the first tutor of Sayyid Muhammad Hasan. After this great scholar passed away, Sayyid Hasan Bidabadi became the new tutor of the young student, giving him sips of the knowledge of the pure Household. The young Sayyid Muhammad Hasan Shirazi, before his twenties, was acknowledged as a Shia religious jurist by his tutor. Haji Ibrahim Kalbasi was also another teacher of Ayatollah Muhammad Hasan Shirazi. The 29-year-old Mirza Shirazi spent his time in Isfahan enjoying the scientific company of many great scholars in this city and after receiving the permission to release fatwas from the Islamic Seminary of Isfahan, Ayatollah Mirza Shirazi left this city and traveled to the holy cities of Najaf and Karbala. By the shrines of Imam Ali and Imam Husayn, peace be upon them, Ayatollah Shirazi kneeled at the presence of many great scholars such as Sheikh Hasan Kashif Al-Ghita, Sheikh Muhammad Hasan Najafi, the author of Jawahir, Sayyid Ibrahim Qazwini the author of Zawabit, and Sheikh Mashkur Hulawi. or of Shiraz and asked him to treasure such a great scientific character in their city. However, when the great Mirza left the Islamic Seminary of Karbala and paid his last visit to the shrine of Imam Ali in holy Najaf, he was invited to a meeting with Sheikh Ansari, an exceptional Islamic jurist in this city. After this scientific meeting with Sheikh Ansari, the Ayatollah Mirza Shirazi sensed the awe and greatness of this scholar and decided to enjoy this ocean of Fiqh and Usul. And so, the talented Ayatollah Mirza Shirazi changed his mind and stayed in Iraq. Since that day, Mirza Shirazi became one of the special disciples of Sheikh Ansari until death broke up between the two great scholars. The great Sheikh Ansari, with his full knowledge of the high scientific character of Mirza Shirazi, among all his students, put his trust in Mirza Shirazi and chose him to revise his precious work, the book of “Rasael”. Mirza Shirazi left great legacies and trained many renowened and top students such as Mirza Muhammad Taqi Shirazi, also known as the second Mirza, Sheikh Abdul Karim Haeri, the founder of Qom seminary, Mirza Husayn Naini, the martyr Sheikh Fazlullah Nouri, Mullah Muhammad Kazim Fesharaki, and Sayyid Muhammad Kazim Yazdi, the author of Urwatul Wuthqa. In 1864, after the death of Sheikh Ansari, the great Mirza Shirazi was elected as the leading Marja of the entire Shia Muslims around the world. All actions of Great Mirza Shirazi were to serve his ultimate agenda of promoting and defending the culture of the pure Household and the genuine Islam. However, his tenure as the leading Marja, coincided with a very critical period in the contemporary history of Shia Islam. As the leading Marja, the great Mirza Shirazi defended the oppressed Afghan Shia Muslims, stopped the invasion of the Jews to the Muslims in Hamedan, prevented the Russians from purchasing big swaths of lands in the city of Tus, dispatched Ayatollah Sayyid Abdul Husayn Lari to fight back the agents of Britain in South of Iran and supported the freedom fighters in this region. Finally, this great religious and political leader, the Great Mirza Shirazi departed this world in 1894, at the age of 82 and his pure body was laid to rest in the holy shrine of Imam Ali, peace be upon him, in the holy city of Najaf, in Iraq. The late Mirza Muhammad Taqi Shirazi is a prominent figure in the history of Iraq, mostly famous as the leader of the 1920 revolution in this county. He was also considered as one of the pioneers of Fiqh experts in the sixth epoch of Shia Islam. In fact, Mirza Muhammad Taqi Shirazi is named as the junior Mirza, in comparison to the senior Mirza, who was the late Ayatollah Sheikh Muhammad Hasan Shirazi. The junior or the second Mirza, during his tenure as the leader of the popular revolution of 1920, united the Iraqi tribes against the British colonizers and imposed a humiliating defeat on the British army, forcing it to retreat from the borders of Iraq with heavy financial and military losses. into a pious family in 1842, in the city of Shiraz in Iran. His father, Mirza Muhib Ali Shirazi was a religious and knowledgeable person. Most of the childhood of the junior Mirza was spent in his hometown but as he grew up, his father sent him to the holy city of Karbala to begin his Islamic studies in this city. Mirza Muhammad Taqi passed the preliminary stages of Islamic sciences under great teachers such as Sayyid Ali Naqi Tabatabaei, who deceased in 1833. Later on, the young Mirza Muhammad Taqi studied the science of Usul, under the great Ayatollah Fazil Ardakani. In the following years, Mirza Taqi Shirazi, along with his friend and schoolmate, Ayatollah Fesharaki Isfahani traveled to the city of Samarra and studied under the great Mirza Muhammad Hasan Shirazi. Not so long after that, these two scholars surpassed all other students of the great Mirza Shirazi and started teaching different religious materials. After the death of great Ayatollah Mirza Muhammad Hasan Shirazi in 1894, large numbers of his students were attracted to Mirza Taqi Shirazi and enjoyed his vast knowledge in Islamic sciences and almost immediately, Ayatollah Mirza Taqi Shirazi became famous as the second Mirza. After the death of Ayatollah Sayyid Muhammad Kazim Yazdi, the leadership of the Shia Muslims was transferred to Ayatollah Mirza Muhammad Taqi Shirazi. By the time, this great scholar was living in holy Samarra, but then he migrated to the holy city of Karbala on February 1919. 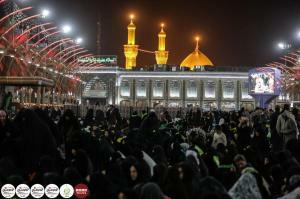 Upon his arrival to this city, the large number of Shia Muslims embraced their new religious leader magnificently. Although Mirza Taqi Shirazi was in his late eighties, this great scholar, with his high morale, energetically lashed out at the British colonizers in Iraq. ed that the unequivocal and direct confrontations of Mirza Muhammad Taqi Shirazi would be a big obstacle for their plans in Iraq. Therefore, they invested all their efforts in silence this great scholar and convince him to comprise, but the second Mirza never gave up to their proposals and maintained his stance. The revolution of 1920 against the British colonizers was deeply indebted to the supports and fatwas of the great Mirza Taqi Shirazi. In the meantime, and despite the bulk of political and social conflicts, Mirza Taqi Shirazi never missed any chance to pursue his academic and scientific projects at the Islamic seminaries. He always tried not to let his political and social movements stop him from educating talented students of Islamic sciences. from their teacher, even though they had received the title of Islamic jurist themselves. Sheikh Agha Bozorg Tehrani, a great and pious scholar describes Mirza Muhammad Taqi Shirazi in these words: “He was a very intelligent and well-mannered person. His holy and inviting face would remind people of the Almighty God. He had no requests from anyone; even when he was thirsty, he used to get up and get some water for himself. Also another scholar narrates: “Most of the times, he was wearing very simple clothes with patches on them. Once I told his son, Mirza Abdul Husayn that why his father wears such old and simple clothes, despite being the leader of the Iraqi revolution against British colonizers. He answered: My father has inherited a farm in Shiraz. The annual income of this farm is around one hundred Tomans. My father pays for his family by this meagre money and he has no other incomes. So he has to be economical and wear such old clothes in order to afford to pay for his family with that one hundred Tomans. ment, his strong demands for restoring the rights of the Iraqi people and the revolutionary fatwa of this scholar are sheer examples of his religious fervor. All of these unique qualities pinned the love of this great scholar into the hearts of the public and he used this popularity, to serve the people. Mirza Taqi Shirazi faced many ups and downs, until he bought the independence of Iraq at the cost of his life and the life of his children. The leadership of 1920 revolution of Iraq was the climax of the political life of Mirza Muhammad Taqi Shirazi. ational conflicts, gave a positive response to the people of Basra and issued verdicts and obliged the public to form resistance and fight against the British invaders. Following this verdict, the religious scholars ushered the army of the brave Iraqi tribes and soldiers to the battlefields. Ayatollah Mirza Muhammad Taqi Shirazi, who was living in holy Karbala, raised the spirits of the people to fight the British colonizers. This great scholar pioneered the resistance against Britain to restore the trampled rights of the Iraqis and in this way, he issued his historic verdict that united all Iraqi people to rank against the British invaders. In the wake of this verdict, a public revolution, which was later famous as the 1920 revolution, succeeded to force out the British army from Iraq. Ayatollah Muhammad Taqi Shirazi, in the first half of 1919 called for a religious scholar, Sheikh Mahdi to keep company and use his counselling in religious and political affairs. Meanwhile, Mirza Taqi Shirazi asked for other great people, such as Ayatollah Kashani, Sayyid Muhammad Ali Shahrestani, Mirza Ahmed Khorasani, and his son Mirza Muhammad Rida to help him in leading the revolution and the public affairs of the Iraqi Muslims. In fact, these five people were aides of this great scholar in critical and serious moments of leadership. Subsequent to the elections in Iraq, there were scattered protests in cities like Baghdad and Karbala against the Great Britain. 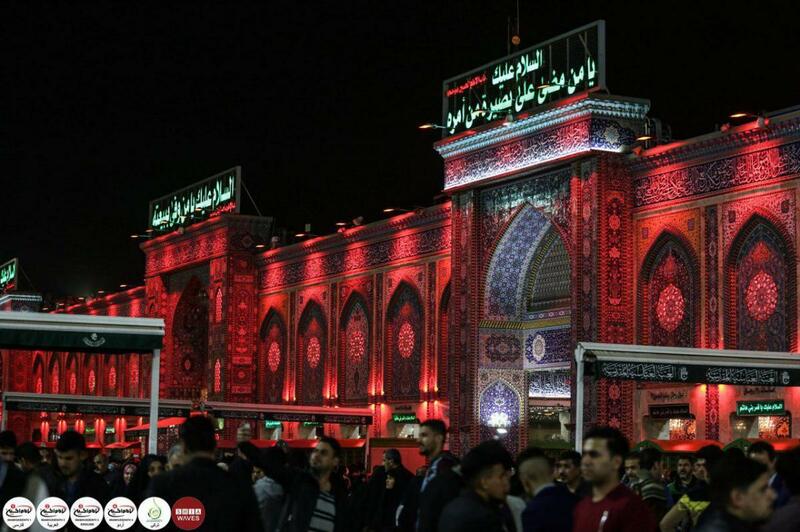 In holy Karbala, Mirza Muhammad Rida, the son of Mirza Taqi Shirazi founded an establishment called “The Islamic Community.” The purpose of this establishment was to combat the guardianship of Britain and set Iraq free from the foreign powers. The Islamic Community also intended to put a Muslim leader at the helm of the country after its independence. Therefore, Mirza Taqi Shirazi used his influence over the public and issued a verdict to strengthen this establishment. Shortly after the foundation of the Islamic Community, Britain decided to arrest and exile the active members of this establishment. In August 1919, several members of this community were arrested and sent to Baghdad, and then, they were exiled to India. Following these arrests and exiles, Mirza Taqi Shirazi strongly criticized these measures in his letter to the chief commander of the British occupants in Iraq. The Islamic leader, Mirza Taqi Shirazi demanded the immediate release of the detainees. However, the answer to this letter was disappointing, but the threats of Mirza Taqi forced the British hands to release the detainees and let the people on exile come back to their country. Ayatollah Mirza Muhammad Taqi Shirazi published his famous verdict which allowed the Iraqi people to use force and military action and defend the country against the invaders. This verdict was later famous as the defensive verdict. However, Ayatollah Sayyid Murtida Tabatabaei has a different account of the death of Mirza Taqi Shirazi. It was the British who poisoned the late Mirza Muhammad Taqi Shirazi and killed him. This vicious plan was carried out by one of the agents of the British forces, who for long pretended to be a devout and pious person, acting under the cover of a simple salesperson. The death of the late Mirza Muhammad Taqi Shirazi was a big blow to the Shia Muslims in Iran and Iraq, and Shia Muslims in these countries held widespread ceremonies in memory of this great scholar. After the departure of this great scholar, the leaders of religious movement chose Ayatollah Sheikh Fathollah Isfahabi, famous as Sheikh Al-Shariah to take the helm of popular revolution. them to their real owners. The great Shia scholars and the brave men of the Shirazi family in Iran and Iraq were mostly descendants of Abul Hasan Mirza Muhammad Ali Shirazi, who was the father of Qa’ani, the famous poet and a second forefather of the great Mirza Muhammad Taqi Shirazi. Mirza Habibullah (1807-1855), he was the son of Mirza Muhammad Ali Shirazi famous as Qa’ani, the famous poet and an uncle of the great Ayatollah Mirza Muhammad Taqi Shirazi. Mirza Muhib Ali (?-1873), he was the son of Abul Hasan Mirza Muhammad Ali Shirazi Haeri. Mirza Muhammad Ali (?-1901), he was the son of Mirza Muhib Ali Ale Shirazi, and the elder brother of Mirza Muhammad Taqi Shirazi. 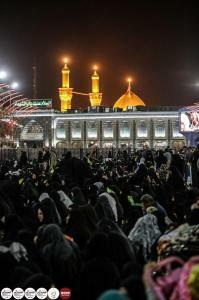 He was one of the Shia scholars and jurists in holy Najaf, Iraq. Not so long after the passing of these great names, the history once again repeated itself and introduced another sparkling star from the Shirazi family to the Muslim world. in the holy city of Najaf, Iraq in 1928. At the age of nine, the young Muhammad Shirazi accompanied his father, the Grand Ayatollah Mirza Mahdi Shirazi to the holy city of Karbala. Ayatollah Muhammad Shirazi studied the preliminary levels of Islamic sciences under many great teachers such as his father, Grand Ayatollah Mirza Mahdi Shirazi, Grand Ayatollah Sayyid Hadi Milani, Grand Ayatollah Sheikh Muhammad Rida Isfahani, Grand Ayatollah Sayyid Zainul Abedin, and Ayatollah Sheikh Jafar Dashti. ey and traveled to holy Qom, Iran in 1978. Ayatollah Sayyid Muhammad Fatimi Abhari, Ayatollah Sayyid Abdullah Shabistari, Ayatollah Sheikh Akhtar Abbas Najafi, Ayatollah Sheikh Roushan Ali Najafi, Ayatollah Sheikh Husayn Barghi, the Islamic scholars of the seminary of Zaynabiyah in Damascus, Ayatollah Sheikh Jafar Rashti, Ayatollah Sheikh Muhammad Kalbasi, Ayatollah Sheikh Muhammad Hijri, Ayatollah Sheikh Muhammad Ali Khaliq Shirazi, Ayatollah Sayyid Mahmoud Mousawi Isfahani, Ayatollah Sheikh Mahmoud Danesh, Ayatollah Sheikh Ibrahim Mishkini, Ayatollah Sheikh Murtida Ardakani, Ayatollah Mirza Ali Ghurawi Alyari, Ayatollah Sayyid Razi Al-Din Shirazi, Ayatollah Sheikh Hasan Saeed, Ayatollah Sayyid Ali Ra’eesi Gorgani, Ayatollah Sayyid Husayn Alavi Khorasani, Ayatollah Nasrullah Shabestari, Ayatollah Sheikh Muhammad Husayn Lankarani, Ayatollah Sheikh Hashim Salehi, Ayatollah Sheikh Mahdi Haeri Tehrani, Ayatollah Sheikh Yahya Nouri, Ayatollah Sayyid Kazim Mudarresi, Ayatollah Sayyid Ahmed Faali, Ayatollah Sheikh Mahdi Faqih Imani, Ayatollah Sayyid Muhammad Ali Alemi Balkhabi, ayatollah Sheikh Murtida Ansari, Ayatollah Sheikh Abul Qasim Rouhani, Ayatollah Sayyid Hamid Al-Hasan, Ayatollah Sheikh Ahmed Payani, Allamah Sheikh Bagheri, Allamah Taqaddusi, Allamah Akhundi, Allamah Sayyid Saeed Waezi, Allamah Sayyid Muhammad Tehrani, Allamah Sheikh Abdul Husayn Akhund, Allamah Sheikh Mahmoud Ansari, Allamah Sayyid Muhammad Sabzewari and so on and so forth. The good morals and inviting tone of Grand Ayatollah Sayyid Muhammad Shirazi had even impressed his opponents who used to say: No one should meet him, because his mild morals and appealing words make anyone attracted to him. The Grand Ayatollah Sayyid Muhammad Shirazi began his career as an Islamic writer after he had the honor to meet the twelfth leader, Imam Mahdi in the mosques of Sahlah and Kufa where he was given the order to serve the culture of the AhlulBayt by his pen. Over the years, the Grand Ayatollah became acknowledged as the king of authors, a title given to him by the Arab Writers Union in 2002 after nearly 1200 publications in his name. The gravity and the depth of the scientific character of the Grand Ayatollah Shirazi can be deduced from his encyclopedic work on Islamic Jurisdiction, which comes in 150 volumes, addressing more than fifty thousand topics in Islamic legal questions. The late Grand Jurist’s book, “Jews Playing the World” was a big step towards uncovering the yet-hidden plots and aspects of Zionism. This book angered the Israeli policy makers and convinced them to become more serious about the assassination of this great scholar. This book has been republished for many times in many different countries in almost 50 different languages. The encyclopedic work on Islamic jurisdiction: This title is a thorough study on nearly more than 50,000 juridical issues in 150 volumes. The series is a vocal sign of the competency and mastership of Islamic jurisprudence by the late Grand Ayatollah Shirazi. Al-Usul: It is a collective and precise survey on the science of Usul in eight volumes. The collection is now one of the textbooks at the Islamic seminaries. Isal Al-Talib Ila Al-Makasib in 16 volumes, Al-Wusul Ila Kafayatul Usul in five volumes, Al-Wasael Ila Al-Rasael in 16 volumes, the commentary of Sharh-e Mansume by Sabzewari, and finally Al-Qawaed Al-Sadid Fi Al-Tajrid Wa Al-Balagha. ment. Other books of the late Grand Ayatollah Sayyid Muhammad Shirazi included different titles for the children such as stories of the God’s messengers, and the Islamic beliefs in a simple language. The late Grand Ayatollah Sayyid Muhammad Shirazi contributed to the foundation of tens of mosques, Islamic centers, schools, libraries, publication centers, interest-free loan funds, and clinics. Moreover, the Shia Muslims and the followers of the Grand Jurist also set up many religious and cultural institutions in different countries such as Egypt, Sudan, England, Canada, the US, India, Pakistan, Australia, the Arab Gulf countries, Iran and Iraq. The late Grand Ayatollah Shirazi had a leading role in the foundation of Islamic seminaries in countries such as Iran, Iraq, Syria, and Kuwait where tens of Islamic schools were sponsored and supported by his eminence. Hundreds of Islamic students and teachers in Iran, Syria, India, Pakistan, and Afghanistan received scholarships and monthly grants from the Office of the Grand Ayatollah Shirazi. The Islamic School of Lady Zaynab, which was founded by the Grand Jurist’s brother, the martyr Ayatollah Sayyid Hasan Shirazi also enjoyed the full supports of the late Grand Ayatollah Sayyid Muhammad Shirazi. The new and ground-breaking thoughts of the Grand Ayatollah Sayyid Muhammad Shirazi, along with his strong roots in the genuine Shia Islamic beliefs are clearly visible in his arguments and discussions, since his eminence always relied on the well-founded sayings of the pure Household and the holy verses of the Quran. The numerous publications and books of the Grand Jurist are also a good way to approach the deep and insightful thoughts of the late Grand Ayatollah Shirazi. ideological schools of thought; therefore, the Grand Jurist abandoned the outdated and obsolete discussions and defined new set of frameworks for religious discussions and scientific debates in the Islamic academic circles. The optimistic and inspiring spirit of the late Grand Jurist was also an important and influential aspect of this great character in the world of Islam. Now, this positive spirit can still be felt through the books and publications of the late Grand Jurist, Ayatollah Sayyid Muhammad Shirazi since his eminence always condemned pessimism and negativity and encouraged the Muslims to move towards their bright future. Besides producing massive scientific and technical materials for researchers, intellectuals, and the scholars, the late Grand Ayatollah Shirazi spared no efforts to introduce the deep and the most complicated Islamic beliefs to the public through easy-to-understand and simple books. With a glimpse over the publications of the late Grand Ayatollah Shirazi, it can be seen that his eminence addressed the most challenging Islamic concepts for a variety of audiences, including the great Islamic scholars and the public groups of people. Above and beyond his great scientific status, the late Grand Ayatollah Sayyid Muhammad Shirazi was mostly famous for his moral way of life and ethical manners in all stages of his career. devotion in the face of hardships, his unique sense of leadership and perseverance in the face of pressures, and lastly his confidence in the Almighty God and the holy AhlulBayt were all important qualities of the late Grand Jurist which made him outshine his time and place. Finally, this exceptional character and unique Shia Islamic scholar departed this life in 2001 and was laid to rest in the sacred shrine of Lady Ma’sumah, peace be upon her, in holy Qom, Iran. in 1927, in the holy city of Najaf, Iraq. The childhood of Sayyid Hasan Shirazi was enriched with the love of the pure Household, under the influence of the sacred shrine of Imam Ali, peace be upon him, in holy Najaf. Soon, this pure love led the young Sayyid Hasan Shirazi to continue the path of his scholarly forefathers at the Islamic Seminaries. Years passed and Sayyid Hasan Shirazi fed his interminable thirst for the knowledge of pure Household and finally achieved the level of Ijtihad. The martyr Ayatollah Sayyid Hasan Shirazi served the religion of Islam with his life in many different countries such as Syria, Lebanon, Iraq and Egypt. als and publications of Ayatollah Sayyid Hasan Shirazi was an influential vehicle that revolutionized the Arabic literature and promoted the culture of Shia Muslims in Iraq. In these years, the unyielding spirit of the young Ayatollah Hasan Shirazi and his strong and critical articles made him a strong barrier to the propaganda machines of the anti-Islamic movements. In Syria, Ayatollah Hasan Shirazi was successful to establish the Islamic Seminary of Lady Zaynab, peace be upon her, which helped him to widen the scope of his religious and cultural activities among the Alawite Muslims. The foundation of the cultural and scientific assembly of the “League of Scholars” and the School of Imam Mahdi in Lebanon were also among the great legacies of the martyr Ayatollah Hasan Shirazi. ey to this African country and in his short stay, he began the construction of an Islamic Center. Back in Syria, Ayatollah Hasan Shirazi was vocal in opposing the Baath party. This great tireless scholar focused his activities to raise the public awareness and in this way, he underwent many hardships and difficulties. Finally, on his way to the funeral service of martyr Muhammad Baqir Sadr, Ayatollah Hasan Shirazi was attacked by Baath agents and was martyred on a Friday, May 2, 1980. 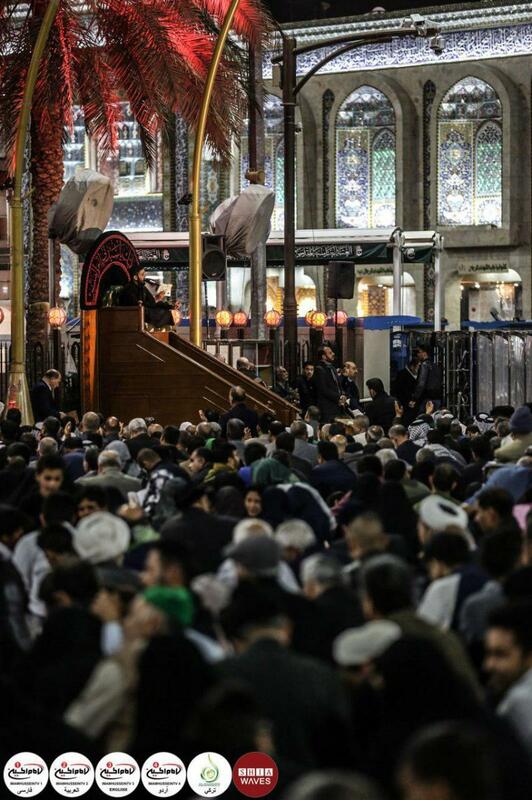 His pure body was taken to the holy city of Qom, and after the Grand Ayatollah Mar’ashi Najafi performed the prayers on his body, he was laid to rest in the shrine of Lady Ma’sumah, peace be upon her. 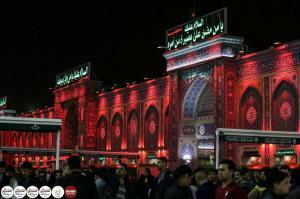 in holy Karbala, Iraq into the family of Shirazi scholars, who are mostly renowned for their knowledge and devotion. Sayyid Muhammad Rida Shirazi was the eldest son of the late Grand Ayatollah Sayyid Muhammad Shirazi, who was the author of 150-volume-study of Islamic Fiqh and a descendant of the Great Mirza Shirazi. 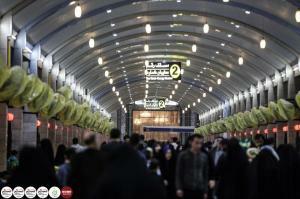 He began his Islamic studies as a child at the school of “Protectors of Quran” in his hometown, holy Karbala. Then, the ten-year-old Sayyid Muhammad Rida Shirazi wore the Islamic robe of the clerics and officially enrolled at the Islamic Seminary of holy Karbala. In his time in this Islamic Seminary, the young Sayyid Muhammad Rida Shirazi studied the preliminary levels of Islamic sciences under famous teachers in holy Karbala; however, this period came to an end after the Baath regime persecuted the Grand Ayatollah Sayyid Muhammad Shirazi. Following this event, Sayyid Muhammad Rida left the country with his father and immigrated to Syria and then, to Kuwait. ey to Iran and the holy city of Qom. This city, due to its competitive and enriched scholarly atmosphere, was an inspiration to the young and talented Ayatollah Sayyid Muhammad Rida Shirazi. In short, the young Ayatollah Shirazi passed the advanced seminary materials and benefited from the advanced jurisprudence courses of his father and uncle, and many other exceptional Islamic jurists. to Kuwait where he spent a few years away from his father. ed to Iran and was warmly welcomed by his father, uncle, relatives and friends. 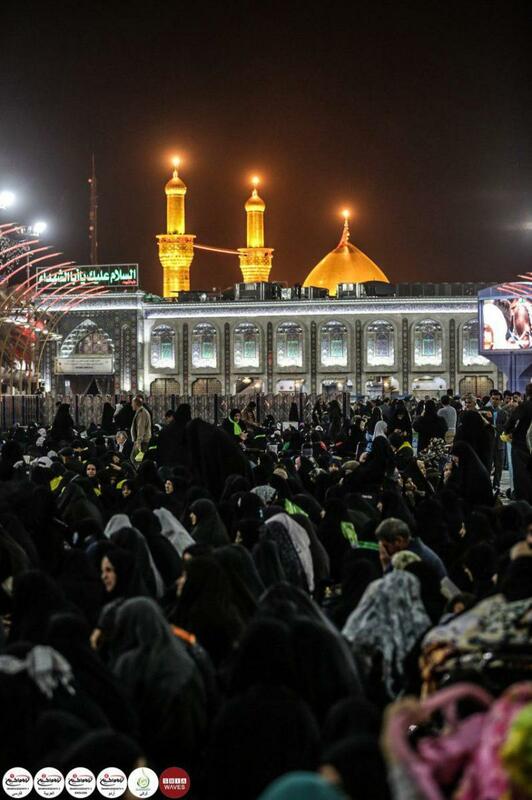 He spent the rest of his life in the holy city of Qom, near the shrine of Lady Ma’sumah, peace be upon her. Ayatollah Sayyid Muhammad Rida Shirazi dedicated his whole life to studying and teaching the different branches of the Islamic sciences such as Fiqh (Islamic jurisdiction), Rijal (authenticity of hadiths and narrators), Tafsir (interpretation of Quran), and ethics. At last, in June 2008, the life of another tireless Shia Islamic scholar from the family of Shirazi, Ayatollah Sayyid Muhammad Rida Shirazi came to an end and the news of his death left the Islamic Seminaries and the Shia Muslims in shock and grief. The moving lectures of the late Ayatollah Sayyid Muhammad Rida Shirazi touched upon the hearts of the people from all age groups; and so, he didn’t miss any chances to introduce and spread the culture of the Prophet’s Household to the public. He had his own innovative methods to discuss the different religious subjects. He addressed all subjects with a serene and serious manner, broke them down into digestible bits of information, and then cemented his claims with strong and reliable verses of the Quran and the narrations of the pure Household. Sometimes, the late Ayatollah Muhammad Rida Shirazi employed stories or historical events to simplify these subjects to his audiences. With the emergence of TV satellite channels and following the foundation of several Shia TV networks, the name of the late Ayatollah Muhammad Rida Shirazi, as a top Islamic thinker, became known even in a wider scope of our world’s geography. His lectures, particularly the weekly courses of Islamic ethics which were aired on the Shia TV channels of Al-Anwar and Al-Zahra, became an attraction to a large number of people from all age groups, and even from other faiths and sects of Islam. Ayatollah Sayyid Muhammad Rida Shirazi weighed big emphasis on all affairs relating to Iraq and the sacred shrines in this country. On different occasions, he made many fiery lectures to condemn the destruction of the sacred shrines, the last of which was the shrine of Imam Hasan Askari in Samarra. In that lecture, the late Ayatollah uncovered the distorted and baseless ideologies of the assailants and demanded the Iraqi authorities to begin reconstruction projects of this sacred shrine. Meanwhile, he always encouraged the Shia Muslims to renovate the cemetery of Baqi and used all means for that purpose. ers of the Islamic sciences. The late Ayatollah Muhammad Rida Shirazi was a living personification of moral virtues and ethical principles and his spiritual and unique personality traits always impressed the people who had the chance to meet him in person. The following is a brief view on the moral virtues of the late Ayatollah Muhammad Rida Shirazi. In the views of the late Ayatollah Muhammad Rida Shirazi, humility and servitude to Almighty God were the basic foundations of faith. This belief had made the Ayatollah to become an embodiment of humility, piety, devotion and self-observance. He had no obsession towards the worldly luxuries and had invested his entire life in the servitude of the Almighty God and the pure Household of the holy Prophet of Islam. Friend or foe, everyone had no way but to admit the high morals of the late Ayatollah Sayyid Muhammad Rida Shirazi. He had special respects for everyone, never interrupted people, and always tried to take loads off the shoulders of his believing fellows. Also, he never let his great position as an eminent Islamic scholar stop him from doing his personal chores. Therefore, he didn’t ask anyone to do his tasks and when someone helped him, he showed his utmost gratitude. Just like his father, Ayatollah Sayyid Muhammad Rida Shirazi was a patient and enduing person, who never let the problems and hardships take the better of him. Even in the most despairing moments of his life, his inviting and attractive smile was a resemblance of tranquility and serenity to all people around him. Not only the Ayatollah never became angry for the insulting words of the ignorant, but also he always responded such behaviors with a mild and respectful manner. In scientific discussions, Ayatollah Sayyid Muhammad Rida Shirazi was greatly observant and meticulous. Whenever confronted with a complex scientific question, he examined all influential factors and did a wide research on the topic in order to discover the true answer for the question. In cases, these researches and examinations took weeks long, but the Ayatollah Muhammad Rida Shirazi never withdrew from a question. There were times that the Ayatollah gave the answer to some questions after weeks or even months, when even the person who asked the question had forgotten about his question. 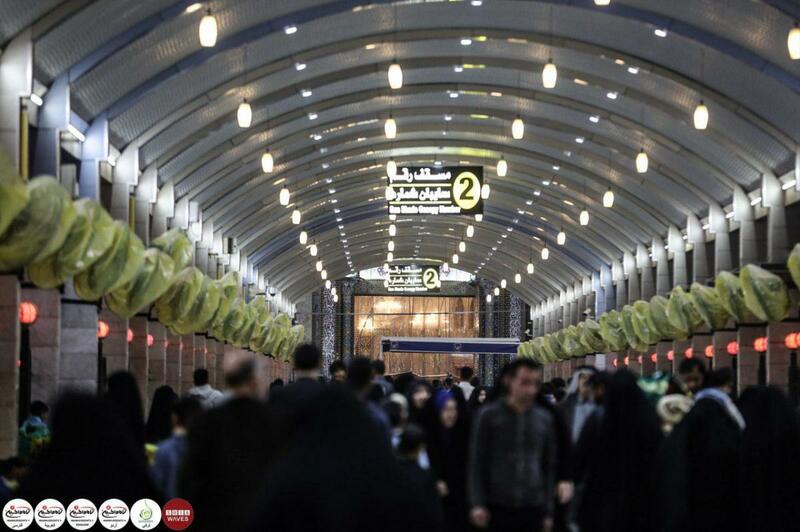 Another distinguishing feature of the late Ayatollah Sayyid Muhammad Rida Shirazi was his punctuality. He always was present in the class, before his own students and he never canceled a session with prior notice. This punctual and orderly behavior inspired many students to establish a more serious determination for their future Islamic studies.